Bandera Negra (Black Banner) by Rebeca Lane, Guatemala. Feminist Hip-Hop is a music movement that appropriates the style and aesthetic of popular American Hip-Hop to advocate women’s rights and gender equality. Young artists from various countries across Latin America are using Hip-Hop rapping to critique manliness, misogyny, and evaluate the general understandings of gender within Latino cultures. Hip-Hop Feminism tends to relate more closely to third-wave feminism, in which notions of ‘universal womanhood’ are critiqued and it’s participants dealt more specifically with race and class. Participants in the movement seek to criticise the media’s mainstream representation of Hip-Hop and provide alternative music that promotes egalitarianism in race, gender, class, sexuality, and identity. Hip-hop culture originates from The Bronx, New York City from the 1970s. Initially started by Disc-Jockeys (DJ’s) and self-titled ‘Masters of Ceremonies’ (MC’s) who began using turntables to create mixes of various songs for young people to dance to. One of the foremost figures of American Hip-hop was Kool Herc, who advocated his dance parties as a means of deterrent from gang fighting in the local neighbourhoods. The idea was that the community would get together and burn off energy dancing rather than fighting. The scene includes MC’s, Rapping, Breakdancing and Graffiti. The culture of Hip-hop developed out of minority groups and communities that had been excluded from mainstream society. For example, the way that The Bronx was left mostly derelict during the late 1970s. The people living there were forced to forge their own culture as a reaction to living on the peripheral of American life. The Bronx during the 1960s was known for extreme fires and dilapidated neighbourhoods, the conditions were compared with living in a war zone. The people living in the Bronx felt dislocated from the rest of New York City. Hip Hop emerged as a successful subculture which allowed individuals to voice their concerns and highlight discrimination. Latin American Hip-hop spread from North America to central, south and the Caribbean. Where large concentrations of immigrant areas in the United States tended to bring back the music style with them when visiting family and friends from their original countries. For example, the music was transferred from Miami, USA to the Caribbean island nations through radio transmissions and records being imported by family members and friends. Latin American Hip hop uses Spanish language lyrics and varies with the sound styles. Generally it includes the customary sounds of hip-hop (the backtracks and repetitive beats) with Spanish language and slang. Some artists feature Latino dance rhythms such as Cumbia or Salsa music rhythms combined with the more traditional back beats. Latin America tends to be associated with heavy sexism, ownership and violence against women. As a response to this, there is a growing subculture within Latin American hip-hop of women who are using the music as a platform to critique the music industry as well as their own cultures. Artists began using the music style to spotlight social issues for women’s rights. One of mainstream concerns of Hip-hop is its association with extreme masculinity, advocating of dangerous life-styles as successful characteristics. Hip-Hop feminists are appropriating the music style to reconstruct these beliefs. “Hip-hop feminism is much more than feminism, and it focuses on more than feminist issues, misogyny, and patriarchy. Hip hop feminists use hip hop culture as one of their primary points of departure to highlight serious social issues and the need for political activism aimed at racism, sexism, capitalism, and heterosexism as overlapping and interlocking systems of oppression […] hip hop feminists are simultaneously expanding the range and uses of intersectional theory and complicating what it means to be both a hip hopper and a feminist“. Much of the controversial hip-hop stars within the United States use their lyrics to degrade women and often feature in their video clips the ‘Hip Hop Honey/Video Girl’. These women are a variation of the ‘Ride-or-die Chick’ willing to support her man and his illicit lifestyle despite how this might endanger or harm her. Also known as ‘video vixens’, these women are often aspiring actors, singers, dancers, or models who appear in men’s hip hop music videos. There are several female artists and groups who are using the music to advocate women’s rights and combat the masculine narrative that hip-hop is for men. 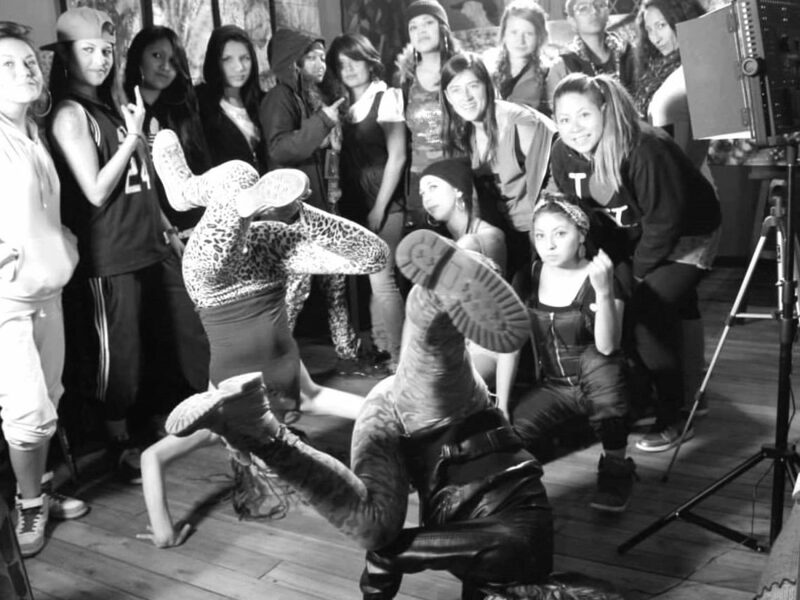 An example of such a group are “Somos Mujeres; Somos Hip-Hop” (“We Are Women; We Are Hip-Hop”) which currently includes 12 women from 10 different countries across Latin America. MC Audry Funk from Mexico, met Roja (from hip-hip duo Rima Roja en Venus) from Ecuador whilst performing in New York City. 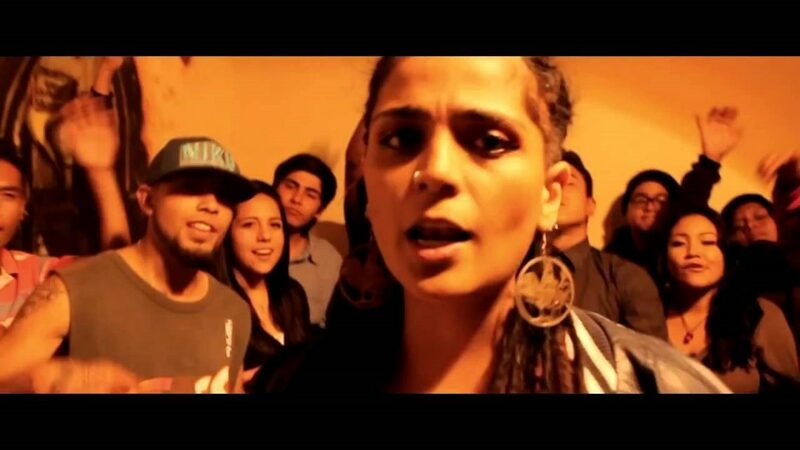 In 2013 Roja organised the first festival ‘Somos Mujeres; Somos Hip-Hop’ in Quito, Ecuador. 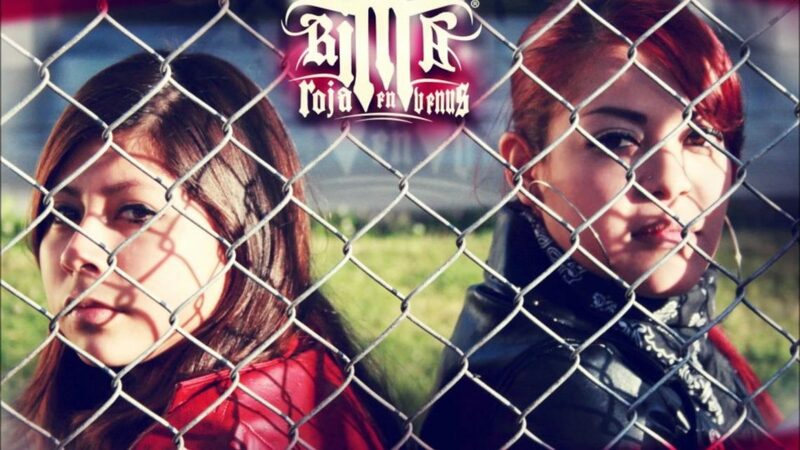 As various other artists have joined, including Rebeca Lane, Guatemala, it has continued to expand into female hip-hop collective. In 2015 the group recorded 12 tracks in an album titled ‘Latinamérica Unida’ on SoundCloud. Rebeca Lane talks about her use of music as protest, to highlight the gender inequality and violence against women in her country, as well as Latin America. So one always feels unsafe, either because you’re a woman, or you’re an activist, or simply being a young person. Having tattoos, looking different, in Central American territory, it’s a threat because you’re affecting the internal (order) and what should be, which is what militarism wants to impose on us–a single way of thinking, and this single way of thinking has to do with very traditional roles, both political and gender roles. The groups intend to use their music to raise awareness of the social issues across Latin America, combat sexism in the industry and act as role models to young women internationally. The lack of space for women in the industry has made the women participating organise themselves, form alliances and create their own events. Hip-Hop traditionally served as a space for the marginalised to voice their concerns and contest the popular narratives. Rap battles across Latin America tend to refer to the size of men’s testes as “Huevos” in Spanish (meaning ‘Eggs’). Refered to by Grandmaster Caz as Like growing up in Beirut (…civil war)– Hip Hop Evolution Documentary and also from news reports about the time. Kirsty Flockhart is Head of International Cooperation at GAPA.